Judge Anthony Alaimo’s life is a metaphor for quintessential American values: courage, hard work, patriotism, compassion. This biography does not dwell in the realm of metaphorical; it plunges us into the day-to-day life of an immigrant family struggling in the depths of the Depression to become Americans, of an immigrant son putting his every dream on hold to pursue a greater passion: love of country. It carries us into the madness of air warfare, the horror of a screaming crash into the frigid North Sea, the terrible realization and burden of living with the knowledge that you survived when everyone else died. The son of illiterate, but deeply religious Sicilian immigrants, US District Court Judge Anthony Alaimo shined shoes and cut hair in Jamestown, New York, to pay for his college education. (He was the Golden Gloves boxer attending the quiet Methodist College.) As a POW, he participated in the world-famous Great Escape, and later broke out on his own, making his way through German lines into Switzerland. A mother’s love, religious faith, and ferocious patriotism transform an impoverished immigrant boy into one of the Greatest Generation heroes. 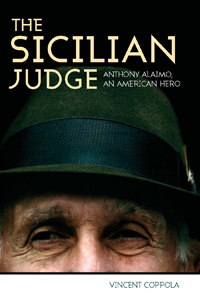 This book takes us inside the incandescent life and tumultuous times of Judge Anthony Alaimo, WWII bomber pilot, POW, and indomitable escape artist, whose fidelity to the law is equaled by his compassion and outrage at injustice.